The width and height of each bird is measured, as well as its wingspan. This past June, a Gray Catbird flew through the Coverdale Farm Preserve in Greenville. As part of his research, Dr. Ian Stewart, an adjunct professor in the Department of Biological Sciences at the University of Delaware, captured the bird through the use of a loose netting that he had set up at the Preserve. Holding the bird delicately in his hands, Stewart saw that a tiny aluminum band had been fastened around one of the bird's legs, indicating that it had been banded. On the band, an identification number had been imprinted. The Delaware Nature Society developed a bird banding pilot program this past fall at the Ashland nature Center and Bucktoe Preserve. There are, at last count, just under ten thousand identified species of birds in the world, and hundreds of billions of individual birds that circumvent the globe, but at that moment, the only bird Stewart wanted to know about was the one he held in his palm as if it were the gentle key to unlocking a mystery. Stewart wrote down the identification number on the bird's band, and let the Catbird go. Soon after, he submitted the band number to the U.S. Geological Survey and received a certificate from them, one that gave him all of the data he needed. 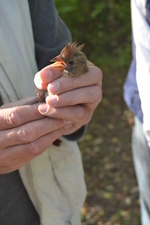 The bird had been banded at the Rushton Woods Preserve near Newtown Square on Sept. 23, 2014. Because Catbirds migrate, it flew to the southern United States, or possibly the Caribbean for the winter of 2014-15, and then flew back home to Delaware – to the Coverdale Farm Preserve. The number on the band had solved the mystery, the miracle – and quite potentially the future – of migration, flight and survival. Bird banding is an important tool for scientists and conservationists to determine if certain species of birds remain in the same site year-round, or in the case of long-distance migrants, where they spend their summers and winters, and the routes they take. 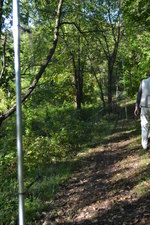 Fine netting, nearly undetectable to the human eye, were set up along nature trails at the Ashland Nature Society in order to capture birds for banding. Thanks to the Delaware Nature Society, the study now has a local flavor. Banding also allows the determination of the minimum length of time that an individual bird lives, is used to estimate population numbers, and allows for the comparison of normal, wild banded birds with birds that may have had their survival altered by exposure to environmental hazards – some that humans are also capable of contracting – such as Lyme disease and encephalitis. This past summer, the Society began a local pilot program to specifically study the migrating and breeding species of birds, which took place at the Ashland Nature Center and nearby Bucktoe Creek Preserve. From June thorugh November, the project banded hundreds of birds from 45 species, primarily Gray Catbirds, Tufted Titmice, Northern Cardinals, Nuthatches, Brown Thrasher, Willow Flycatcher, Northern Flicker, and Hairy Woodpecker. The study also included banding baby birds born in nest boxes that focused on the fledging times and rates of Eastern Bluebirds and Tree Swallows. Bands were also placed on Eastern Bluebirds to determine the site fidelity of the species, and whether individual birds winter and summer at Ashland and Bucktoe Creek. University of Delaware Professor Dr. Ian Stewart served as the chief coordinator of the project. On one early October morning, Stewart pulled a small bird that had been captured in the net, with the delicacy of a surgeon. He delicately held a female Cardinal in the palm of his left hand, while the bird's head poked through his index and middle fingers. With his right, he measured the bird with a ruler, while he rattled off the bird's various lengths to a nearby assistant. At Ashland, birds were caught in fine nets that were erected along trails, and then carefully removed. He then gently applied a band to one of the bird's hind legs, with the use of a small pair of pliers, and then fastened it loosely, enabling it to slide up and down the bird's hind leg. Once measured and banded, Stewart took a photo of the bird with a hand-held camera, and then quietly released the bird back into nature in a place of high vegetation, rather than an open field, where a bird of prey can easily track it down. The baseline data from the pilot program at the Delaware Nature Society will be used to refine the approach to an official study that will begin next year, to test a hypothesis about breeding and migratory bird use of different habitats in the Red Clay Valley. A three-year plan has been drafted that will enable the Society to continue the study through 2018, as well as hire a full-time bird bander. 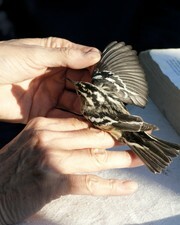 To learn more about the Bird Banding Project at the Delaware Nature Society, visit www.delnature.org.